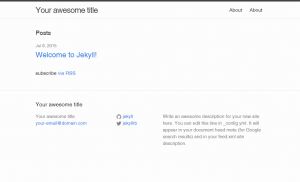 Jekyll is a lightweight blogging platform written in Ruby. Jekyll compiles into a static site with no dynamic endpoints, making it extremely secure and fast. Posts are written using Markdown syntax. Note 1: pay attention to the presence of “.” after --force. This is not a typo. 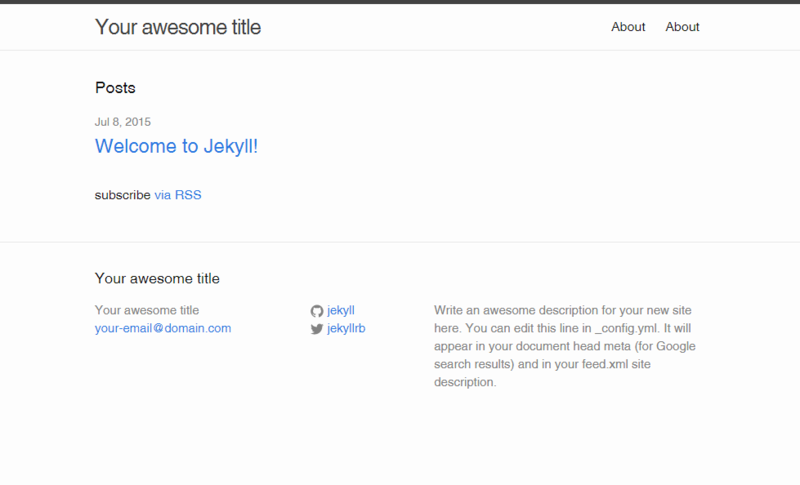 Note 2: although it may be a Ruby application, Jekyll compiles your site from source, creating a static site. A Passenger-compatible filesystem layout is, therefore, unnecessary. Compile your Jekyll website Jekyll from its source and place the files under public/. By default, Jekyll places output into _site/. We like consistency, so link _site/ to public/ to serve as the document root. Attach /var/www/jekyll/public to a subdomain (or addon domain) within the control panel. Access Jekyll! You’re all set! This entry was posted in Ruby and tagged blog, jekyll, ruby.